October 22, 2018 – Our time machine travels back to “the times that try men’s souls,” when Thomas Payne wrote that phrase to embody the struggles of Gen. George Washington’s beaten-but-not-broken army and the precarious cause of American independence. 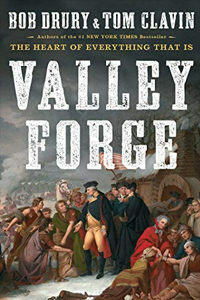 In their new book, Valley Forge , #1 New York Times best-selling team Bob Drury and Tom Clavin provide a fresh look at the winter of 1777. In it, they introduce us to a very human George Washington who’s beset on all sides by an almost comical array of existential threats — disease, desertion, traitors, spies, bickering bureaucrats, and incompetent skinflints in a dissolving Continental Congress. Not to mention the combined military might of the British Empire. Drury and Clavin show case not only the indispensable commander-in-chief, but the common soldiers as well as men like Baron Von Stuben, Alexander Hamilton, the Marquis de Lafayette, and infamous characters like General Charles Lee. It’s a fight that culminates on the sandy plain of New Jersey, when the men who survived the privations of Pennsylvania, stand toe to toe with Great Britain’s best and turn them back. Our guests have previously co-written titles including The Heart of Everything That Is — The Untold Story of Red Cloud, an American Legend, and, Lucky 666: The Impossible Mission That Changed the War in the Pacific . You’ve seen Bob Drury’s work in the nine books he’s authored, co-authored or edited, and in places such as the New York Times, Vanity Fair, GQ and Men’s Journal where he’s a contributing editor and foreign correspondent. Tom Clavin is the author or coauthor of sixteen books, a fifteen-year veteran of the New York Times and contributor to top periodicals including Manhattan Magazine, where he’s the investigative features correspondent.